Released 24 years ago today, Oasis' "Live Forever" was a seminal part of my teenage years. You know those first few songs that changed your entire life when you were a teenager? Those songs that after hearing for the first time, became everything you’ve ever believed in and helped you find a part of yourself that you didn’t know was missing? Those songs that made you swear to your 14-year-old self that no other band’s music would ever compare to the music of your teenage years (even if you were dead wrong)? For me, one of those songs was Oasis’ “Live Forever.” Though I didn’t hear the song when it came out on August 8, 1994 (I would’ve been -2 years old), when I encountered it in my early teens, it was a much-needed lightbulb moment. I hadn’t yet developed my passion for music at the time. I was mostly listening to what everyone else my age was listening to, which at the time, meant whatever T-Pain or Sean Kingston song happened to be popular for that month. After stumbling on the band’s music videos on YouTube, I quickly became obsessed. I didn’t come from a family that was interested in music. I’d love to say that my parents played original Beatles, Stones and Coltrane records around the house or even that I raided my sibling’s collection of Paramore and My Chemical Romance CDs, but I can’t. All the music that I became enthralled by in my teenage years was stuff that I had dug up on my computer in solitude. As a teen, my perception of rock music was that it only consisted of two categories: classic rock like The Beatles, Bruce Springsteen or AC/DC and whatever angsty bands were popular in the 2000s like Green Day, Panic at the Disco or Blink-182. Though I’ve since come to appreciate those two styles of rock, I had no connection to them as a teen. Classic rock was just music that boring parents listened to, and the whole pop-punk and emo thing wasn’t for me. Growing up in Ohio in the ’00s, I soon realized that most people in the states were much more interested in albums like American Idiot than an English band like Oasis who most considered past their prime. I hadn’t heard a band like Oasis before. Liam Gallagher’s voice was gritty and rough but not so much that he couldn’t carry a beautiful, moving melody. People compared his voice to a mix between John Lydon and John Lennon and I always loved that idea of his edgy-meets-emotional vocal style. The band dressed in denim, sunglasses, button-down shirts and fancy parkas and jackets. They didn’t have ripped jeans. They weren’t dressed in all black with crazy hair or piercings. They looked cool but relatable, and even though tons of British people dressed just like them, to me, it was as if they had been transported from Mars. “Live Forever” was the third single that the band released from their 1994 debut album, Definitely Maybe. For me, the song partially symbolized my disillusionment with a lot of the pop-punk that was coming out at the time, much of the same way that it represented the split between American grunge and Britpop in the ’90s. Like pop-punk, grunge often felt angsty to the point of self-destruction while Britpop was charming and uplifting. By 1993, Nirvana had become worldwide sensations and they released a track called “I Hate Myself and I Wanna Die.” I never was drawn in by these kind of lyrics as a kid, even if I really did hate myself and want to die. I had low self-esteem and no sense of self, but I thought if I listened to lyrics like that, it would just make those feelings more real. Instead of facing those feelings head on, I wanted to fast-forward past those dark thoughts to a time where I was happy and sure of myself. Britpop, Oasis and “Live Forever” were the antithesis of this kind of tortured rock star that was mythologized in other genres. It was one of those songs you could listen to and strut down the street with your head held high and your chest puffed out. Even though I probably looked like an idiot, I felt like I had the whole world in the palm of my hands. When Noel Gallagher’s first melancholy guitar solo hits, it cries out like a siren and makes you remember that things aren’t always so happy-go-lucky, but when Liam’s vocals return, everything is okay again, and you’re back on cloud nine. One of the reasons the song is so encouraging and believable without being preachy or cheesy is because of the Oasis brothers’ story. The Gallaghers came from a poor family in working-class Manchester, born to Irish immigrants and the sons of an abusive, alcoholic father. If two poor, foul-mouthed boys from Manchester could take over the UK and the rest of the world with their music after a meteoric rise, why couldn’t I at least have some confidence in myself that I could be somebody and achieve something great if I worked hard? 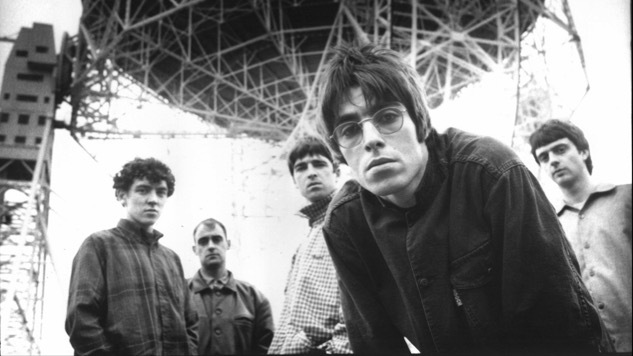 Oasis were one of the first bands I loved and without them, I’m not sure where I would be right now.